There is a sense of anxiety and disappointment among many city of Chicago elected officials Wednesday. The city overwhelmingly went with Democratic nominee Hillary Clinton, but will now have to work with a President Donald Trump. Some are worried about what it means for Chicago’s immigrant population, federal funding and more after efforts during the campaign to remove Trump’s honorary street sign. A protest began early Wednesday evening outside Trump Tower on Wabash at the Chicago River and has grown since then, potentially numbering in the thousands. Protesters are demonstrating a Trump presidency and registering their disapproval as they march their way through the Loop. 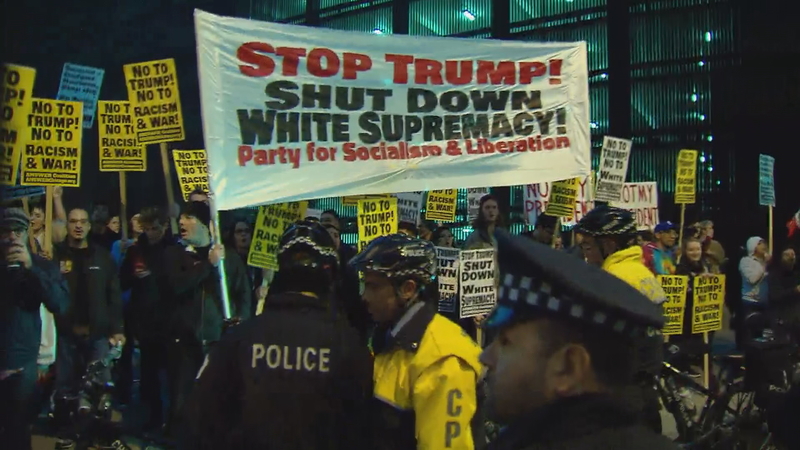 The protest reflected the glum mood of many Chicago elected officials, most who are members of the Democratic Party and supported that party’s nominee for president. There is also significant concern among Latino elected officials, who say they have spoken with their constituents and they are full of anxiety. They’re focused on Trump’s rhetoric about deporting undocumented immigrants, about overturning the executive orders put in place by President Barack Obama to keep undocumented students in this country, or undocumented parents of American-born children. Other aldermen said the election is a clarion call for the immigrant and Latino communities to organize. “I think that the immigrant community is a strong community, we’ve proven we can fight and defend ourselves when politicians try and punish or hurt us, and I think that’s what we’ll see if Donald Trump tries to hurt our community,” said Ald. Carlos Ramirez Rosa (35th Ward). Mayor Rahm Emanuel says Chicago will remain a welcoming city for immigrants. Tuesday night’s humbling defeat has caused some other local Democrats to ponder where exactly their party went wrong. Of course, Chicago was portrayed in a harsh light during a lot of the Trump campaign, with the president elect highlighting the city’s high murder rate. The city relies on the federal government for millions, if not billions in federal funding – things like the extension of the CTA Red Line, bus rapid transit, and so forth. Emanuel says he’s not worried that the federal spigot is all of a sudden going to dry up under Trump. Emanuel is headed to Washington D.C. on Thursday. His itinerary says he will discuss Chicago priorities like workforce training and health care. There are other issues that affect the city. Trump has talked about reinstating Stop and Frisk – a police practice that was ruled unconstitutional in New York. And how will the the U.S. Justice Department’s review of the Chicago Police Department be affected? These are among questions that will all be answered in the coming months. Nov. 9: “To all Republicans and Democrats across this nation, I say it is time for us to come together as one united people,” president-elect Donald Trump said a little before 2 a.m. from his campaign headquarters in New York. Join us on Election Day for a look at what’s at stake in key state, county and local races; and to check results once polls close and final tallies are in.